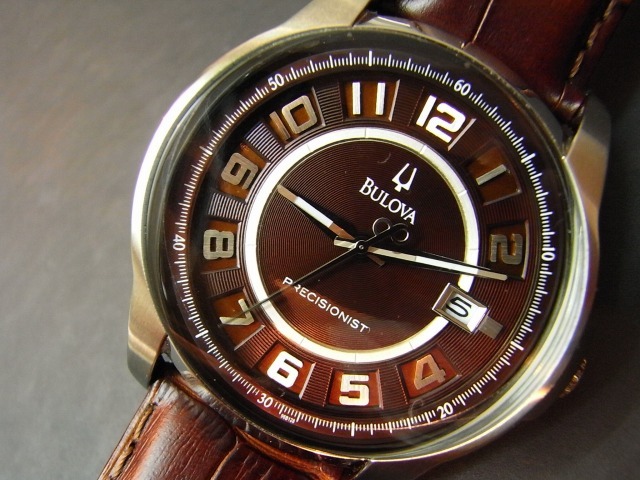 Bulova is an old name in watch manufacturing, at least in the United States. The company traces its roots back to 1875, when Joseph Bulova started selling watches in New York City. Manufacturing began in 1911, according to the company, and Bulova became a leader in marketing their watches, with the first radio watch commercials broadcast in 1926. Bulova wristwatches were very popular in the 1950&apos;s and 1960&apos;s and the company is still known for the famous Accutron watches with their "tuning fork". These are still made today in very limited quantities. Bulova was sold to Citizen in 2008 and the Bulova line of watches is an important part of the corporate strategy. 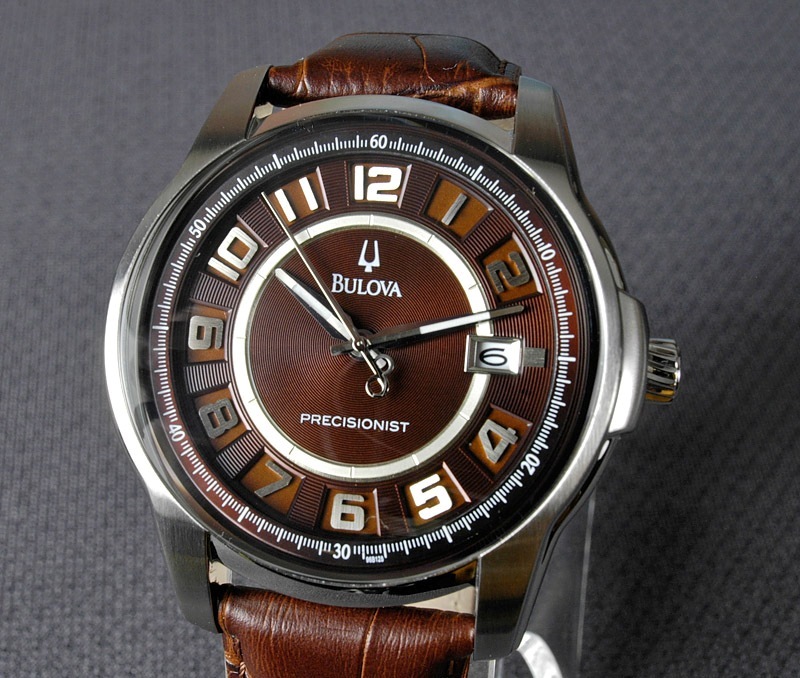 The Bulova Precisionist Claremont is a new series of wristwatches marketed under the Bulova brand. These watches were launched rather suddenly, surprising many wristwatch fans and collectors around the world. The surprise is related to the technology in the Precisionist wristwatches. The Precisionist has a new type of thermo- or temperature-compensated quartz movement, which would be enough of a news flash. But the Precisionist watches also include a "continuous" sweep seconds hand, which is highly unusual in and of itself. The smooth movement of the seconds hand is one of the main selling points of the several-thousand-dollar Seiko Spring Drive watches, and here the same type of action can be found in a watch costing around $250.00. That&apos;s not to say that a Bulova Precisionist is in any way the equal of a Grand Seiko, but it is very interesting to see the continuous sweep seconds hand, associated with very high end watches, in what is really a mass-market wristwatch. The Precisionist watches aren&apos;t quite "HEQ", or High-End Quartz watches, although that depends upon your definition of HEQ. But Bulova lists some very interesting claims for the watch, calling it "the world&apos;s most accurate watch with a continuously sweeping second hand". That&apos;s quite a claim! The irony of watch collecting is that some of the cheapest quartz watches can be much more accurate than even the most expensive high-end mechanical watches made. The most accurate watches are the radio-controlled "atomic" quartz watches, such as the Casio Waveceptor lineup. For example, I have a plan Casio Waveceptor that cost about $30.00 that synchronizes with the NIST "atomic" clock in the U.S. every night, and that watch is as accurate as you can get. It sits next to other mechanical watches costing 10 times as much that not only lose a few seconds each day (the best that can be expected, more or less), but which also stop completely after 36 hours or so if they&apos;re not re-wound. The Bulova Precisionist is not a radio controlled watch, and some collectors put the radio controlled versions in a different category. HEQ watches can refer to "tweaked" quartz movements that are temperature compensated or have other features making them more accurate than basic quartz watches. Bulova says that quartz accuracy depends upon two factors: temperature changes and vibration frequency. They have added a third "prong" to the quartz crystal and increased the vibrations of the Precisionist movement to what they say is 8 times the frequency of a standard quartz watch. This allows the seconds hand to move at 16 times per second, according to Bulova, compared to one beat per second on standard quartz watches where the seconds hand jumps from one second to the next -- and rarely meets the seconds marks on the dial. Mechanical watches usually have seconds hands that move somewhere around 8 (ETA 2824) to 10 times per second, thus the very fine ticking movement seen on most mechanical watches. 16 beats per second is 960 beats per minute and 57,600 beats per hour, roughly twice the frequency of the ubiquitous ETA 2824 movement at 28,800 bph, or 4 kHz. The seconds hand on the Precisionist movement appears to sweep smoothly around the dial, just like an electric wall clock. However, very slight beating or stuttering movements in the Precisionist seconds hand can sometimes be picked up by the human eye, but only occasionally and only under certain lighting conditions. For example, the slight ticking motion can be seen when the watch is illuminated in bright sunlight. Bulova also claims a frequency of 262.144 kHz for the Precisionist movement, although I&apos;m not sure exactly how they are calculating that. They say that the "Precisionist offers the highest vibrational frequency available in any watch today" and that the frequency "diminishes the effect of temperature fluctuations and produces extraordinary precision". Bulova says that most quartz watches will run within 15 seconds per month, but they claim that the Bulova Precisionist is accurate to 10 seconds per year, an impressive feat. And even more impressive considering the price of these watches. The Precisionist line is available in four forgettably-named collections: the Champlain, Claremont, Longwood and Tanglewood. The Champlain collection has a sort of dive watch styling, with what I think are four unfortunately placed Allen screws at each corner of the watch. The faces are busy and the watches have a rather generic, "been there, done that" mass-market styling. The Claremont collection is, I think, styled better than the others, with the semi-sporty brown Claremont version shown in my photos and video. The other two collections are blingy, faux-diamond encrusted creations that any watch collector worth their salt wouldn&apos;t look at twice. It&apos;s too bad that Bulova (Citizen) didn&apos;t go back to their roots for some inspiration (although my feeling is that Citizen watches are generally in need of a styling theme and strategy also). Nevertheless, the Claremont shown here has some interest, with its "3D" face and what appear to be machined numbers. The case is slightly rounded for a good fit over the wrist. It measures 44 mm across, not counting the crown and it&apos;s 51 mm from lug tip to lug tip. The watch takes a 22 mm strap (18 mm at the buckle) and the brown version shown here came with a fairly nice faux alligator brown strap that felt a bit stiff. I replaced it with a beautiful Di-Modell "Imperator" waterproof leather strap shown in the second set of photos. This strap is made in Germany and it was purchased at Freda Watch Straps. It&apos;s a fairly expensive strap at a list price of $69.95, but I had it kicking around, unused after trying it on the Glycine Eugène Meylan, and it looks and feels perfect on the Claremont, if a bit too long. It is also 22 mm and tapers down to 18 mm at the buckle. The Claremont is a nicely weighted watch at 78 grams, including the new strap. It has a nice feel and presence and a unique curved top and crystal. The crystal is some type of polycarbonate, which is unfortunate, as it does feel a bit cheap and a sapphire crystal would give this watch a richer look, in my opinion. It would be nice also if the underside of a sapphire crystal was treated with anti-reflective coating, because the Claremont does have some shiny bits on the face, including the purposely polished seconds hand, which highlights the sweeping movement. The watch is easy to set; pull out the crown by picking it underneath with a fingernail -- the crown guard covers the top of the crown, making it difficult or impossible to pull out the crown in the usual manner. The watch hacks, so it&apos;s easy to set and the date wheel is separately adjustable. There is a slight problem on this particular watch: the second hand has about 1/2 minute of play and the crown has about 1/3 of a turn&apos;s worth of play. This makes it feel like one of those cheap Alpha watches when it comes to setting the time. Push in the crown and the second hand will jump a bit, making it very difficult to set this Claremont to the exact minute. The play is also noticeable as the second hand moves around the face because sometimes it trails the minute mark as the seconds hand passes 12. This quality problem is the most disappointing aspect of this watch, especially since it is called the "Precisionist" and one would expect pin-point accuracy. I&apos;m hoping perhaps this is an early production issue that will be resolved with tighter tolerances, but prospective owners are advised to check for play in the minutes hand before purchasing a Precisionist. One other note, the date can be set separately from the time. This is accomplished by pulling the crown out (carefully) to the first position, then rotating the crown to set the date. The seconds hand does not stop until the crown is pulled out to the second position. So this is a useful feature to change the date without disturbing the time setting. Otherwise, I am enjoying my Bulova Precisionist so far and it&apos;s fun to look at the face with the sweep seconds hand, although I must admit that after a while, the thrill has worn off. Once I got used to seeing it and overcame the initial fun, I realized that it just isn&apos;t that big of a deal and I&apos;m glad I didn&apos;t pay thousands of dollars for a Seiko Spring Drive! I&apos;ve owned my Precisionist for only a week or so at this point, and the accuracy appears to be excellent. It hasn&apos;t varied at all from the initial setting, as far as I can tell. I&apos;ve worn the watch all day, left it crown-up at night and I wear it when exercising or walking, in a variety of temperatures. I&apos;m sure it will take several months to fully assess the accuracy and dependability of the movement. Although there is some very slight lume on the hour and second hand, it is barely noticeable, even after a full dose of bright illumination. So for all practical purposes, the Claremont has no lume, as there is no lume on the numbers. The watch has very good readability though, mostly due to the bright metal or chrome numbers on the face against the darker brown background. I chose the brown color because it&apos;s more unusual than the typical white or black faced watches and also because it looks a bit more "earthy" to me. It goes great with the Imperator brown strap, and I&apos;m pleased with my choice. The Bulova Precisionist Claremont has a list price of only $299.00 and I bought this one for $224.25. Bulova Precisionist watches are just becoming available and can be purchased through the webWatchWorld.com store. Big congratulations to Bulova (Citizen) for bringing this very unique movement to market, making an HEQ and sweep seconds hand watch available to the unwashed masses like me at a very reasonable price. The Claremont is well worth the asking price and I&apos;m really enjoying ownership -- this watch is a keeper!